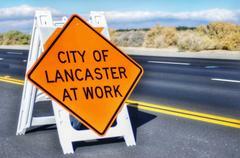 Lane closures at 10th Street West and Avenue I due to Public Works Construction Project 17-012. The scope of work includes traffic signal modifications and pedestrian bulb-outs, in addition to multiple utility and infrastructure improvements. Through May 28, 2019, expect intermittent lane closures on 5th Street East between Avenue H-8 and Avenue J-4 for sidewalk and street improvements related to Public Works Construction Project 17-009. The intersection of Lancaster Blvd. and 15th Street East will be closed to traffic through May 30, 2019, due to Public Works Construction Project 17-007, the Lancaster Blvd. and 15th Street East roundabout. Drivers are encouraged to utilize an alternate route.